If you find yourself in the Seattle area between now and June 17th, take a scenic jaunt over the SR 520 Floating Bridge (the longest in the country!) to the Bellevue Arts Museum (BAM) for the noteworthy exhibition “Knitted, Knotted, Twisted & Twined: The Jewelry of Mary Lee Hu.” Featuring works spanning her 40-year career, including a piece she made as an undergraduate at the Cranbrook Academy of Art in the 1960s, this retrospective of Hu’s work documents the understated depth of her unique wire technique with necklaces, bracelets, brooches, and more from more than 40 prominent collections around the country. Why select Mary Lee Hu for a retrospective at the BAM? 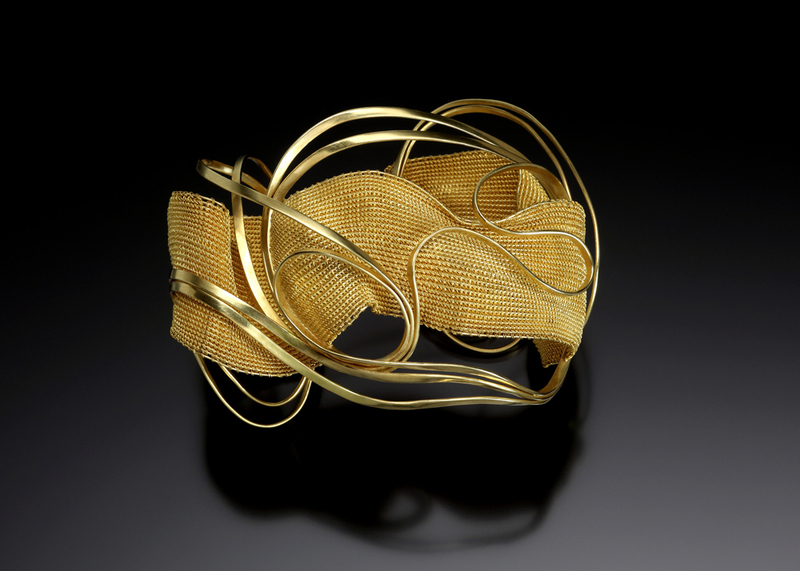 “Knitted, Knotted, Twisted & Twined: The Jewelry of Mary Lee Hu” is one of a series of exhibitions organized by Bellevue Arts Museum celebrating leading Pacific Northwest–based figures in the contemporary American craft movement. This retrospective exhibition and its accompanying splendid publication constitute the first comprehensive look at Mary Lee Hu’s oeuvre and offer the public the opportunity to see and be captivated by the richness and the elegance of her silver and gold jewelry. With approximately 100 exquisite chokers, earrings, rings, brooches, and neckpieces drawn from public and private collections nationally and internationally, the exhibition traces the evolution and refinement of Hu’s processes and skill from her earliest experimental pieces in the late 1960s—capturing the spirit of a time when craft and lifestyle were so passionately intertwined—to the confidence, brilliance, and unique mastery of her contemporary creations. The exceptional beauty and unmistakable style of Mary Lee Hu’s jewelry is recognized and celebrated throughout the world through its inclusion in such major collections as the Victoria and Albert Museum and Goldsmiths’ Hall, London; The Renwick Gallery, Smithsonian Institution, Washington, DC; the Museum of Fine Arts, Boston; The Metropolitan Museum of Art, New York; the Museum of Fine Arts, Houston; The Museum of Arts & Design, New York; and the Art Institute of Chicago. We are honored to have had the opportunity to play a critical role in her artistic life by offering this comprehensive and intimate look at her work to a wide audience. 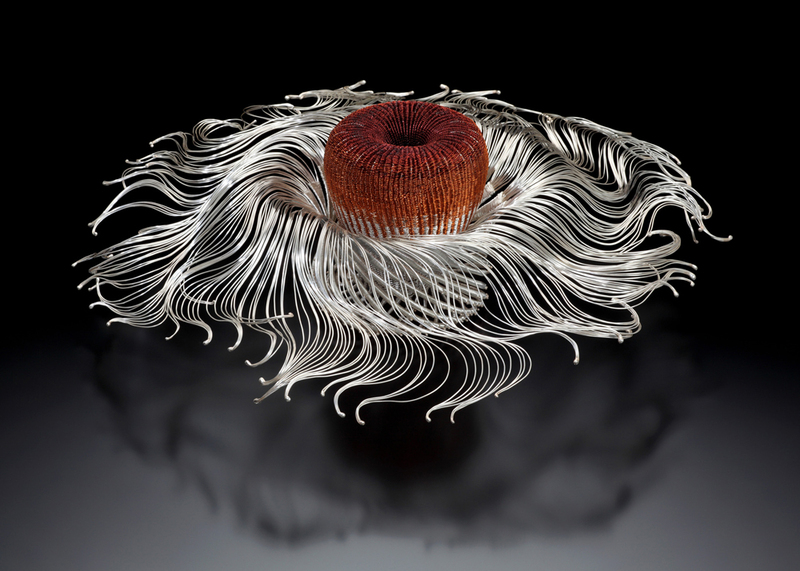 What sets Mary Lee Hu apart from her contemporaries in the field of metals and jewelry? Over the past 40 years, she has affirmed her distinctive voice in the world of jewelry with her elegant and voluptuous creations. Using wire the way hand weavers use threads, Hu has blazed a trail both as artist and innovator, exploring the nexus between metalsmithing and textile techniques, often through the recovery of precedents from the near and ancient past throughout the world, and following her innate aspiration to perfection and her stubborn curiosity in pursuing aesthetic challenge. Keenly responding to the ability of her precious metals to bend and reflect light within a textured surface, Hu has created work that is a testament to her sophisticated eye for weightless and rhythmic lines, translated into body adornment. 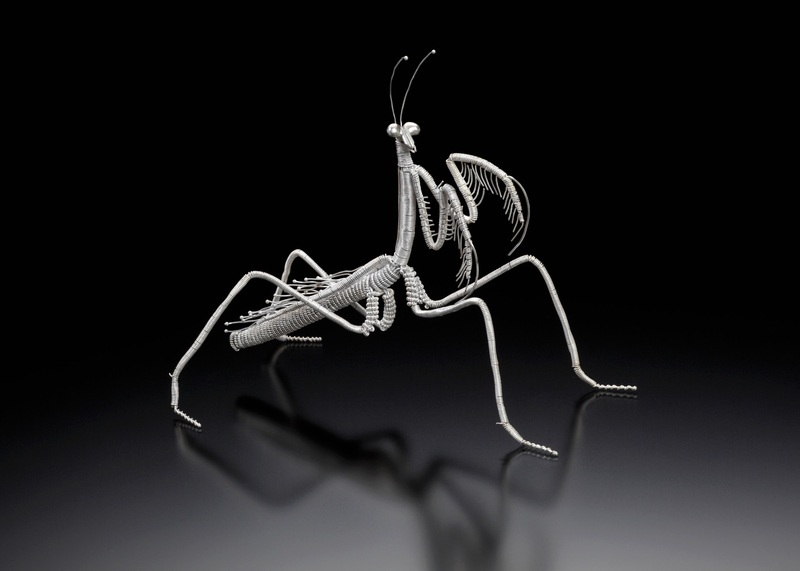 Her graceful and apparently effortless creations, formed by intricate twining, twisting, and knotting, investigate both the possibilities and limits of wire through fusing fiber art and jewelry, structure and pattern, light and line. There is a stubbornness in her pursuit of perfection, which I can't find in any of her contemporaries in the fields of metals and jewelry. Stay tuned for more information on Mary Lee Hu in the April/May 2012 issue of American Craft magazine, or check out our feature on Hu below in the PDF of our Craft Horizons issue from April 1977.